The Port of Antwerp in Belgium has started construction of a €340m ($458m) second lock in Waaslandhaven on the left bank of Scheldt River. It will be located at the end of the Deurganck dock and will connect to the sea between the Scheldt and the Waasland Canal. The new lock will provide fast shipping access to all other docks on the Left Bank: the Doel dock, the Verrebroek dock, the Vrasene dock and the North and South Insteek dock. The design of the new lock will be based on the Berendrecht lock, which is currently the biggest in the world. It will have a length of 500m, width of 68m and will be 17.80m below the local datum level – deeper than the Berendrecht lock. Under the project about 9.1 million m3 of earth will be excavated and 22,000t of structural steel will be used. The port lock is expected to be completed by 2016. The port’s official alderman Marc Van Peel said the second lock is key to the further expansion of our the on the Left Bank of the Scheldt. 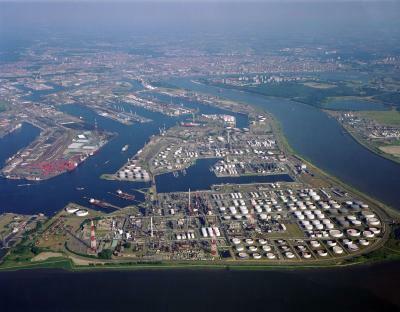 "With a second lock and the deepening of the Scheldt completed last year, the Antwerp Port Authority is responding in an appropriate manner to the increase in the scale of shipping traffic, and we are maintaining our position as the number two in Europe," Alderman said. Half of the cost of the project will be funded by the European Investment Bank (EIB), while the remainder will be provided by the Antwerp Port Authority, the regional Flanders Government and a €81m ($110m) credit line from Belgium’s KBC Bank. Earlier this year, Antwerp awarded a €272m contract to a joint venture, consisting of five companies, to construct a second sea lock. The companies in the joint venture include Jan De Nul, CEI-De Meyer and Betonac, which are part of Royal BAM Group, as well as Herbosch-Kiere and Antwerpse Bouwwerken, part of Eiffage. Currently, Waaslandhaven is only accessible to ships through the Kallosluis lock, which has reached its maximum capacity; the second lock in Waaslandhaven will accommodate the increase in shipping traffic.